A Directory Invitation for 2014! 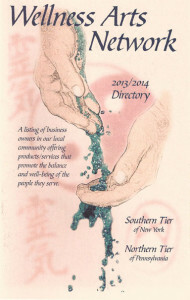 Wellness Arts Network 2014/2015 Directory is published once a year and distributed FREE to the public. We print 2000 copies and distribute them throughout the Southern Tier of NY and Northern Tier of PA. Everyone in the Directory gets copies to distribute as well as library reference desks, community brochure stands, Bed & Breakfasts, coffee shops and any other place we can think of. Your investment is $70.00/ listing. For those who wish to reach the business owners in the network, or the market we serve with the Directory, there is space for ADS in a variety of sizes (see the Ad Form). Of course, you can also do both! 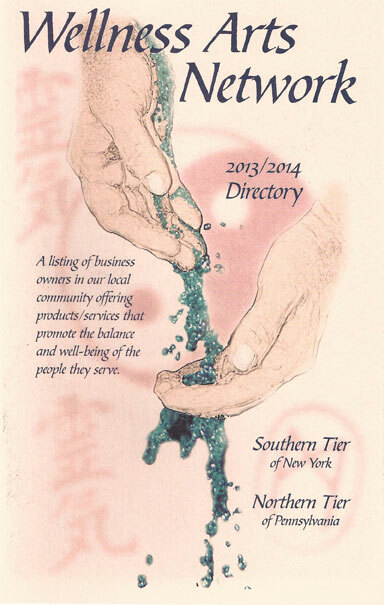 Wellness Arts Network 2014/2015 Directory . with any questions and to place an order. RSVP with copy and payment before February 15, 2014. This entry was posted in Events and tagged community, Directory, Free Distribution, NY PA, Small Business by WellnessArtsNetwork. Bookmark the permalink.